While recent news has focused on other third party application store of Amazon, Opera Software has announced the launch of his own silent mobile application store. The Opera Mobile Store is now available in over 200 countries on all platforms such as Android, BlackBerry, Palm and Symbian. In partnership with Appia, Opera App Store has more than 140,000 free and paid applications for smartphones. Mahi de Silva, director of consumer services mobile Opera Software said that the launch of Opera Mobile Store supports Opera's core belief in an open, multi-platform experience wireless Internet, giving users of Opera for mobile applications, integrated into shop. "The entire press release is below. Oslo, Norway - March 7, 2011 - Opera Software, the leading provider of mobile browsers around the world, today announced that the Opera Mobile Store is now open and available at http://mobilestore.opera.com/. This storefront is a featured Speed Dial link in the Opera Mini and Opera Mobile browsers, which makes the storefront immediately accessible by more than100 million people who use an Opera browser on their mobile phones. The Opera Mobile Store has been built and delivered through a strategic partnership with Appia, the leading provider of open application marketplace technology. 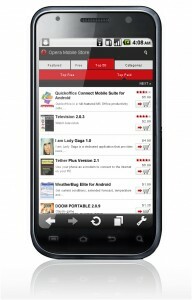 The Opera Mobile Store offers both free and paid applications for virtually any mobile platform and device. The Opera Mobile Store is available to Opera users and users of other mobile browsers, on all popular mobile phone platforms in more than 200 countries. The Opera Mobile Store uses Appia’s storefront commerce technology and leverages a wide catalog of applications for phones with Java, Symbian, BlackBerry and Android operating systems. The storefront experience is customized to each user’s phone, providing a tailored catalog based on the phone’s operating system, local language and currency. "The launch of the Opera Mobile Store supports Opera’s core belief in an open, cross-platform mobile Internet experience by providing Opera users with an integrated storefront of mobile applications," said Mahi de Silva, EVP, Consumer Mobile, Opera Software. "Our partnership with Appia delivers to all Opera Mobile and Opera Mini users easy access to a wide variety of great content, on any device, all over the world." To support the Opera Mobile Store, Opera Software has also launched the Opera Publisher Portal (http://publishers.mobilestore.opera.com), providing developers with an easy way to get their applications onto the Opera Mobile Store and in front of millions of Opera users every month. In its pre-launch state, the Opera Mobile Store attracted more than 15 million users in February, from 200 countries, achieving more than 700,000 downloads per day. These metrics establish the Opera Mobile Store as a top 10 mobile application store around the world. "The Opera Mobile Store presents a remarkable opportunity for mobile application developers to distribute localized content through a single, far-reaching marketplace," said Jud Bowman, CEO of Appia. "Appia is thrilled to partner with Opera to deliver an incredible storefront of applications to Opera users and beyond." Appia is the world’s largest open app marketplace and white label storefront platform, supporting all operating systems and handsets. Today, Appia powers app storefronts for more than 40 partners reaching more than 200 million mobile subscribers in 200 countries and counting. Customers include four of the world’s top five handset manufacturers, three of the top four mobile operators in the US and three of the top ten mobile operators globally including Samsung, Opera T-Mobile, AT&T, and Verizon Wireless. The Appia Developer Program provides partners with a ready to launch catalog of over 140,000 paid and free apps from more than 30,000 global application developers. Appia is headquartered in Durham, NC with offices in Dallas, TX, and Munich, Germany. For more information, visit http://www.appia.com, or follow @Appia. Opera mini is the best mobile browser. I am happy they have lunched there store now we get some useful staff. Excellent article, it’s pleasure to read your blog ? Opera is best internet browser for Mobile browser. Its gives best services for use Internet in mobile.